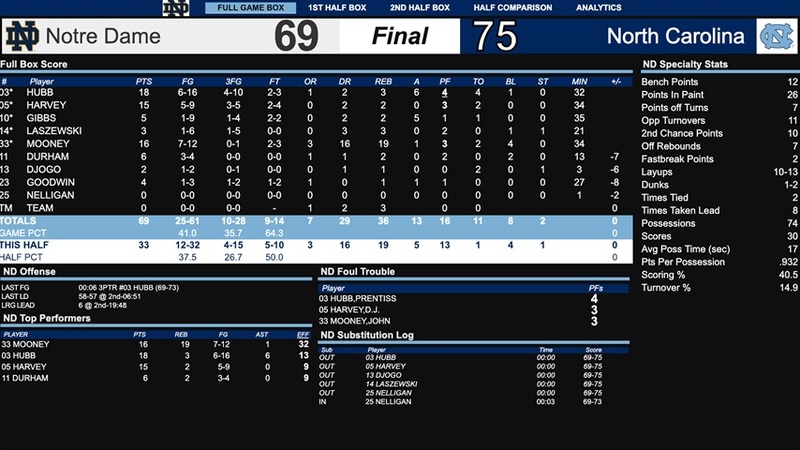 Notre Dame’s (11-6, 1-3) offense went stagnant in the last seven minutes of the game and they were out-classed on the offensive glass down the stretch which led to a 75-69 loss to North Carolina (13-4, 3-1) in Chapel Hill on Tuesday night. Before hitting their last three field goals to end the game, the Irish only hit two field goals in the last seven minutes of the game. Notre Dame led, 58-57 with 6:51 left in the game when Prentiss Hubb hit a layup to give them the lead. This was the beginning of the end for the Irish. North Carolina moments later sparked by a three-pointer by Cody White from the top of the key, the Tar Heels opened their lead to seven with a 7-0 run. 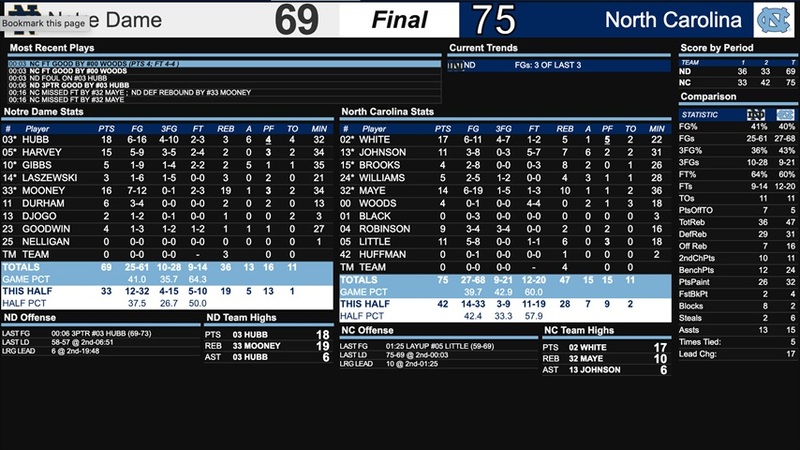 Notre Dame freshman hit one of his two free throw attempts to cut the lead to six, 65-59, but buckets by White and Nasir Little expended the Tar Heel lead to a game-high 10 points. “I’m proud of our group,” said Notre Dame head coach Mike Brey. “This was a tough atmosphere and we knew we’d get a big punch after they had a tough loss on Saturday. We had some clean looks in the second half we couldn’t knock down. You have to make a few more of those to escape. Notre Dame and North Carolina went back and forth until the Tar Heels run with just under seven minutes to play. Notre Dame shot 41 percent and hit 10 three-pointers, but was outrebounded by 11, 47-36 which was crucial in the loss. North Carolina grabbed 16 offensive rebounds to Notre Dame’s six. Despite the loss, John Mooney had a monster game with yet again another double-double. Mooney scored 16 points and 19 rebounds, a career-high. The big man also added four blocks. Hubb added a career-high 18 points and six assists. North Carolina shot 40 percent from the field and hit nine of their 21 three-pointers. White and Luke Maye led the Tar Heels with 17 and 14 points respectively. Little was a big factor down the stretch. He added 11 points and six rebounds. The Irish also forced the Tar Heels into playing at a tempo favorable to Notre Dame, which pleased Brey. “We wanted to control it,” Brey said of the tempo. “I was really thrilled with our transition defense for the most part. I think overall it was great. They want to run. We did a good job. We wanted to play a little slower in the halfcourt, which we did. Everything was just right for us. 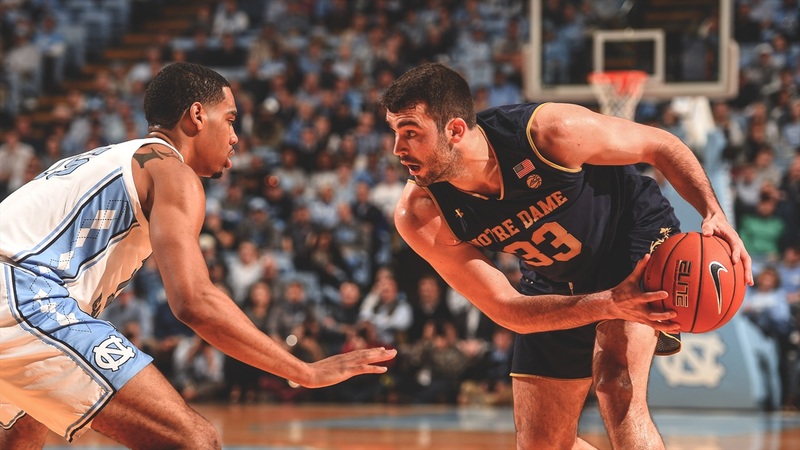 As time expired in the first half, Nate Laszewski rose up for a three-pointer and nailed it to give Notre Dame a 36-33 lead going into the locker room at halftime. Over the last 1:40 of the first half the Irish went on an 8-0 run to rally down five points and go into the half with a three-point lead. It was Notre Dame’s largest lead of the first half. North Carolina started the scoring with a White three-pointer. White’s quick bucket from long range sparked a 7-2 run to start the game. Mooney ended this when he scored back-to-back buckets to pull the Irish within one, 7-6. Brandon Robinson hit a three-pointer to counter the quick burst from the Irish, but TJ Gibbs tied the game moments later with one of his own. Juwan Durham also gave Notre Dame its first lead with 14:46 left in the first half. Gibbs, who missed Saturday’s game with an illness, finished with just five points on 1-for-9 shooting. “My trainer said I couldn’t play him as usual because he’s ill and then I played him 35 minutes,” laughed Brey. “That was our only option. I thought they had fresh guys on him and took him away. This started a back and forth scoring barrage, until both teams when cold mid-way through the first half. Both offenses went stagnant until the final couple minutes. Notre Dame shot 46 percent from the field in the first half and hit six three-pointers. Mooney led the way with six points and nine rebounds. Harvey led in the scoring column with seven points. North Carolina shot 37 percent from the field but put up six more shots than Notre Dame in the first half. They also hit six of their 12 three-point attempts. Maye led the way with 10 points for the Tar Heels.